I added a few fall accents around the kitchen with yellows and golds this year. I have really enjoyed the yellow I added over the summer, and wanted to keep that for fall. Since my mom decorated our childhood dining room with branches of fall leaves for my grandparents' 50th anniversary back in 1976, I have loved doing the same. They don't last long, though, even in water. 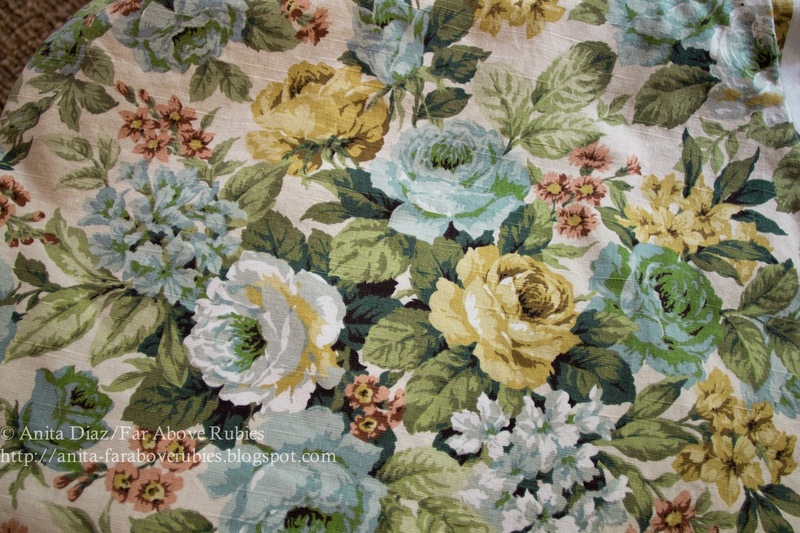 Late this summer, I found a fabric remnant on a trip to my local store that I just loved. There was enough to make pillow covers, a couple runners and window panels for the kitchen. I took down the cafe curtains and valance and added the panels and a bamboo shade. 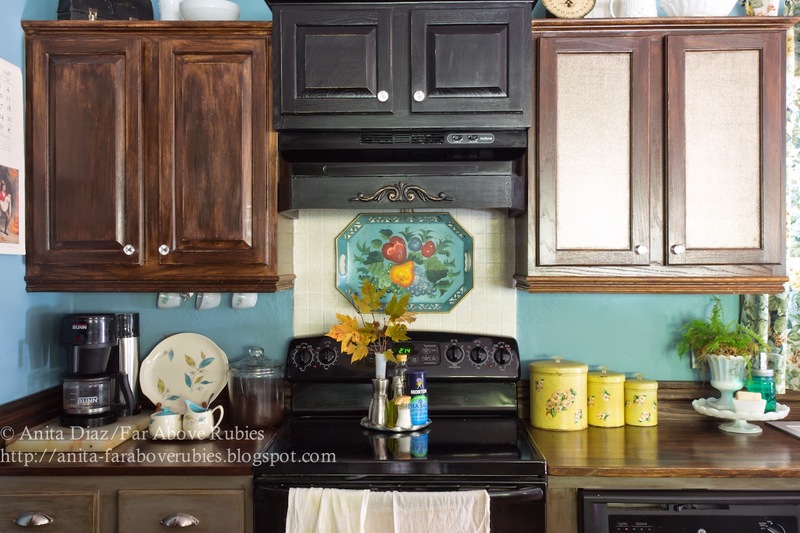 I was seriously thinking about painting the upper cabinets a lighter grey, but when I found this fabric, I was glad I hadn't done that. I really like how the floral fabric works with the dark wood. I kept the shelves pretty much the same from summer. I'm not sure what got into me, but I really like them this way, and again, the fabric really tied everything in so nicely. I just love the blue with the rich gold, and it's such a nice alternative to the usual fall colors. Really, we have amazing Carolina blue skies in the fall and more yellow leaves than anything else, so this combo is a natural choice. 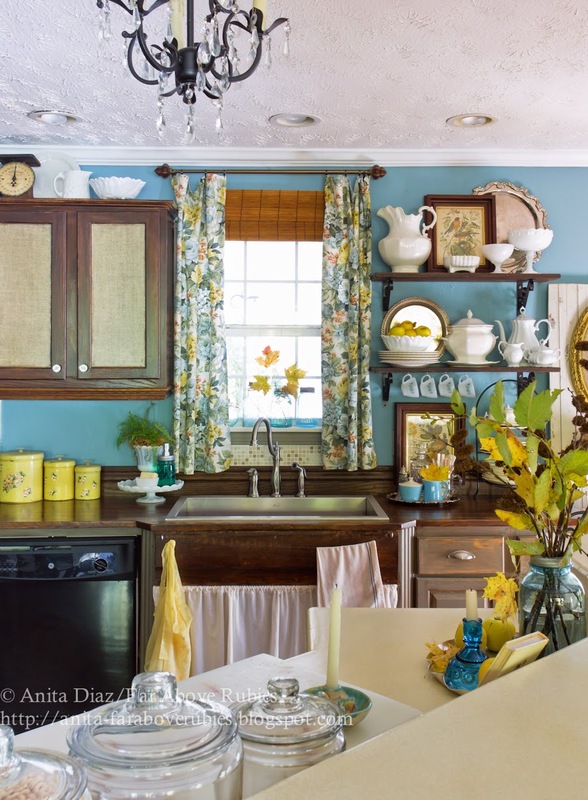 I love the blue and gold touches you added Anita and I love the bamboo shade and pretty floral panels you added to your window...your kitchen is so pretty!! Beautiful kitchen! Isn't it awesome when something like fabric brings it all together and makes you smile? Looks great! Just beautiful Anita! I love the new panels. That print goes perfectly in your kitchen! I added blue to my living room for fall andmixed it with silk leaves...Alas no natural color leaves here yet to even consider using. I love the juxtaposition of the blue with the orange/yello leaves. It looks fresh and nice with the chocolate/natural/pea green colors of the room. 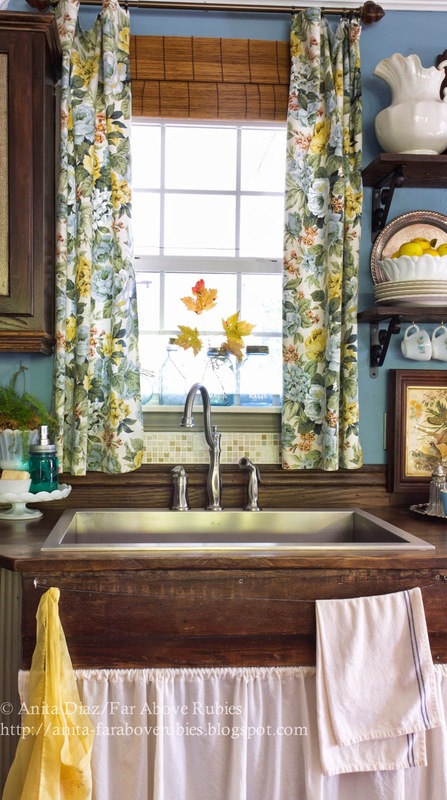 Your kitchen looks lovely, bright and seasonal, just like autumn in the south! It looks so pretty, it is nice to see someone that isn't afraid to use color. 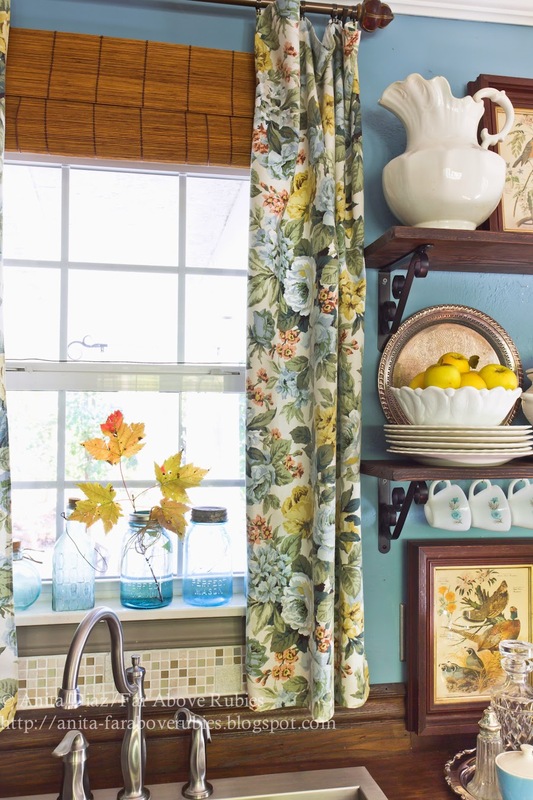 The curtain fabric is fabulous, it ties everything together! Hi Anita! Oh, the new panels look wonderful! 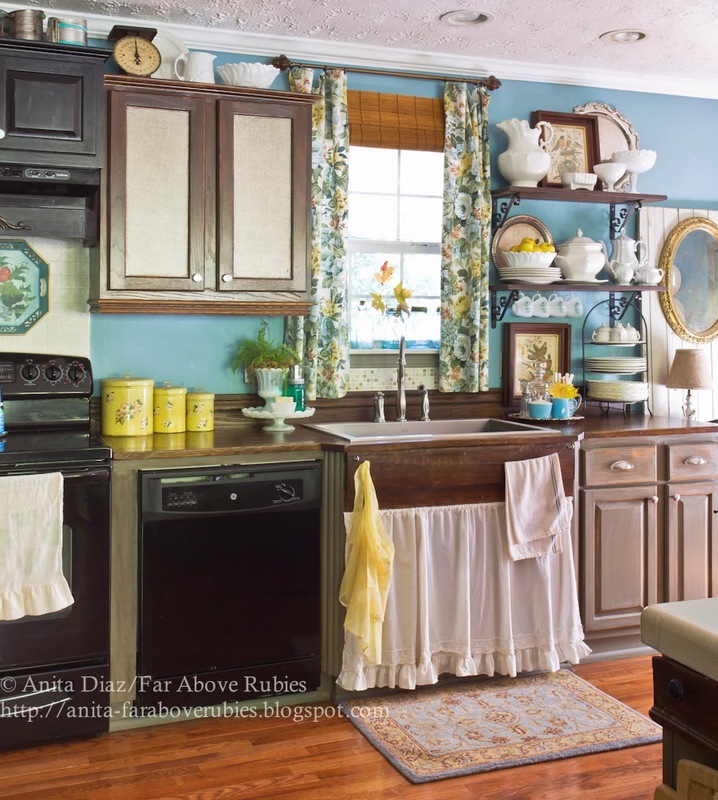 I just love your sweet kitchen! Hope you're having a great week. 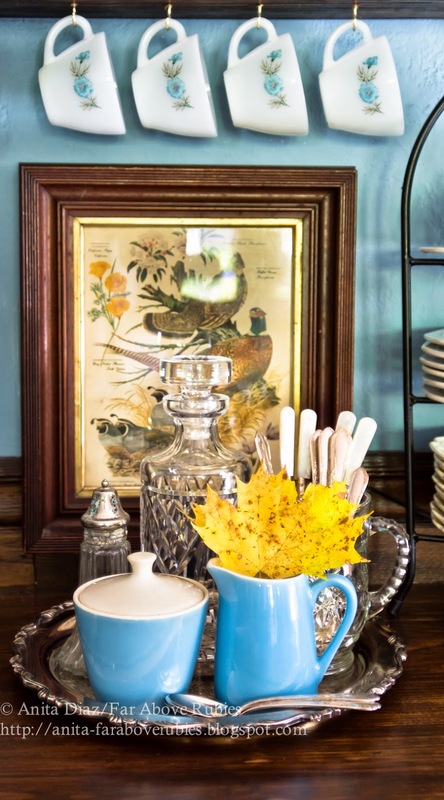 Oh, your kitchen is so pretty decorated for fall. Your sweet personality is stamped all over it. Love the warmth and cheerfulness of your room. Just like you. Great idea about the branches! 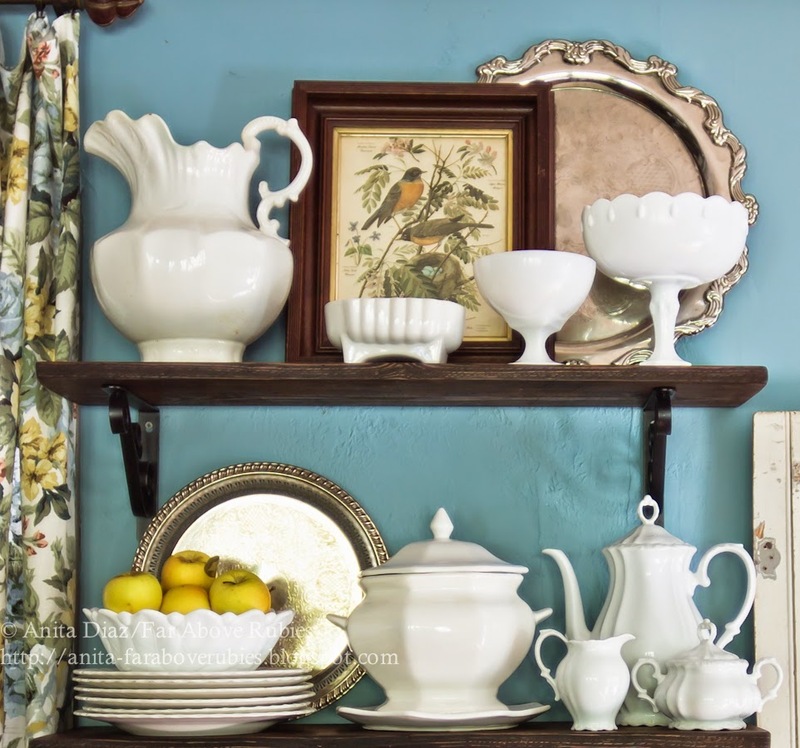 Your splashes of yellow and the silver pieces just make it all come together. Beautiful! 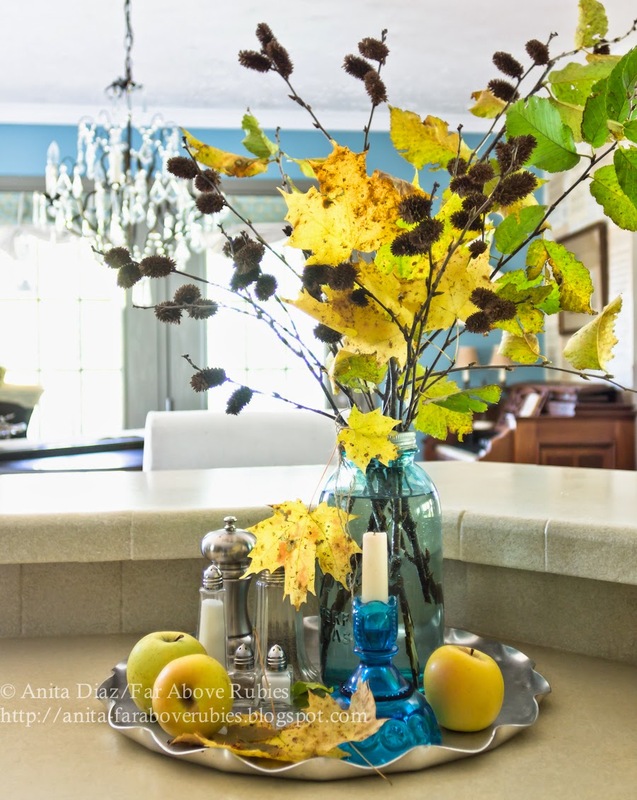 I think I'm going to have to steal your idea with the leaves--what a beautiful, inexpensive way to bring the autumn colors indoors! 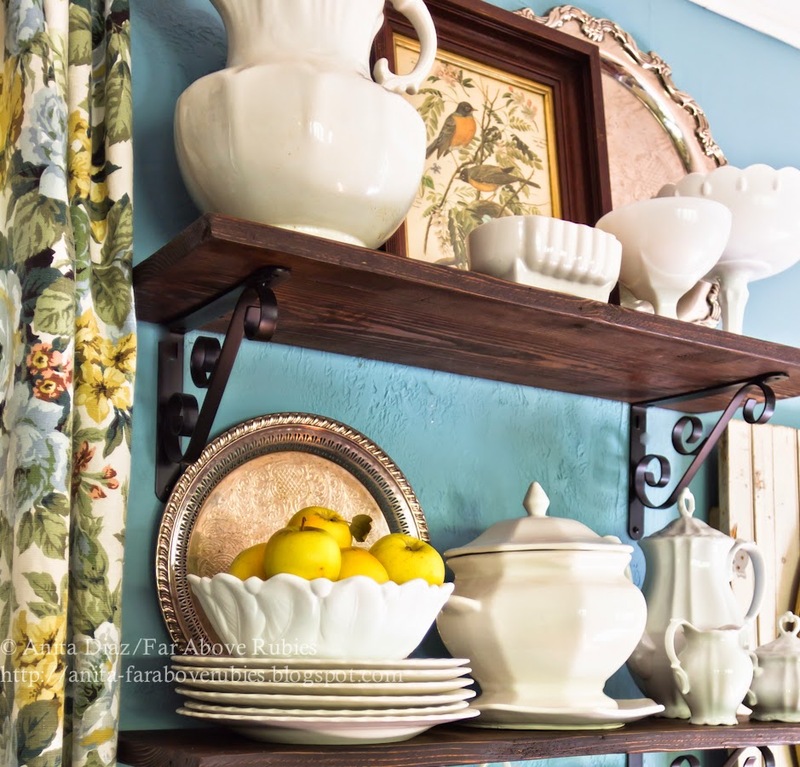 The blue, the pops of yellow, the white glassware, and dark cabinets make your kitchen a place that can't fail to wrap guests in its arms with welcome. It is so beautiful! It is an unusual, not often seen color combination. Gorgeous. I love your kitchen cabinets. Your kitchen is so lovely. I am really digging the pops of bright yellow and those fabulous curtains on the window. Such a pretty kitchen. We just painted our bedroom that color. I am amazed at how wonderful the woods look with it. It's the first thing I noticed that right away in your kitchen. 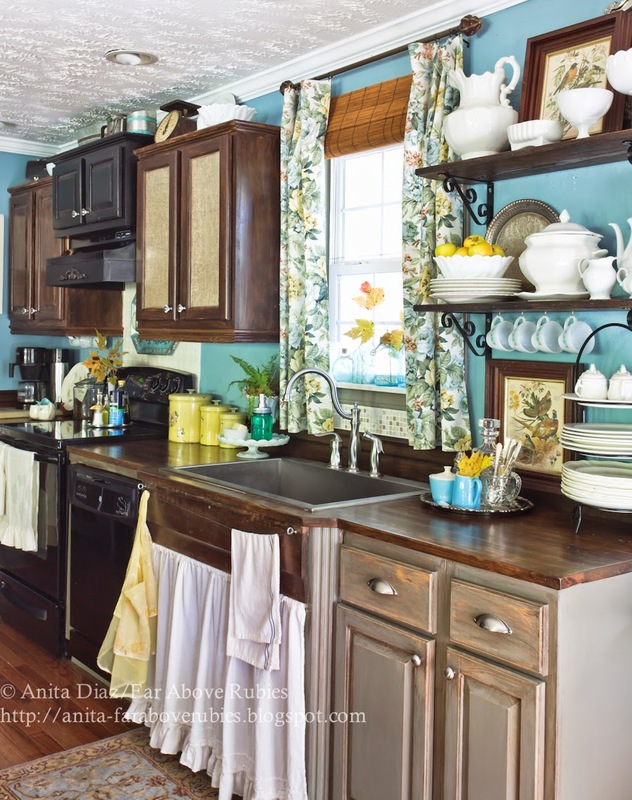 Your kitchen looks great, Anita! The yellow and gold additions are just right and I love the fabric on the curtains! 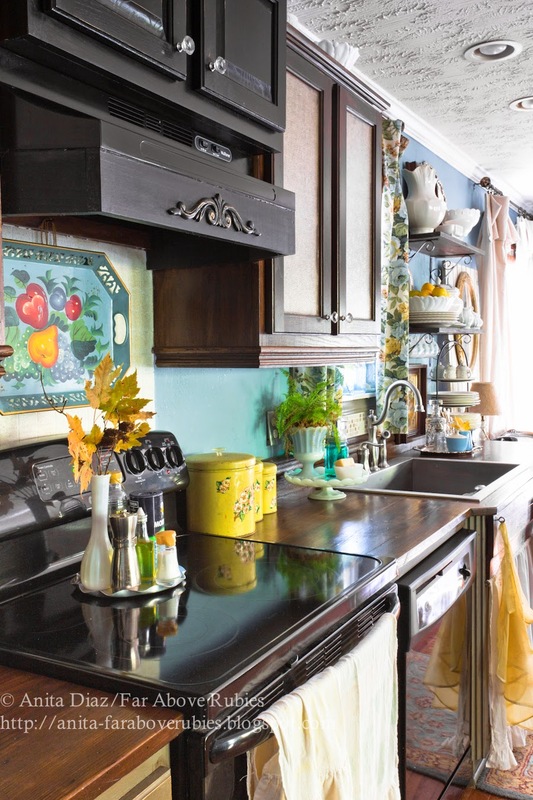 I so love the "autumn gold" in the kitchen...goes so well with those beautiful blue walls!...yes, and don't we all wish our kitchens were always clean!!?? I love your kitchen! The leaves are a wonderful idea. What type of faucet do you have? Thanks Laura:-) The faucet is "Cadenza" by Pfister, and I love it too! !